A tight bond with “Izzy|! !|” (right)|! 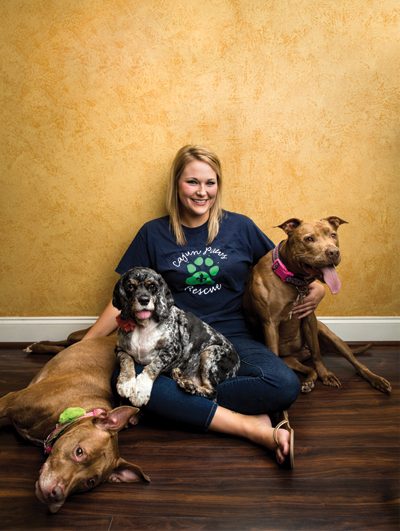 !| inspired Amber Prejean to create Cajun Paws Rescue. Prejean has had Izzy for more than 10 years. The “monster” dwells atop a couch most nights, not some dark, dungy, Scooby Doo cave. Her teeth are menacing, her jaw strong and fierce, though those attributes are wasted considering all this creature wants to devour is an unwrapped Kraft single or a stick of string cheese. She’s more pillow than predator, often offering Amber Prejean — the tamer of this not-so-savage beast — a soft place to rest her head for naps. Izzy, the “monster”, is one of what Prejean calls her “misunderstood pit bulls.” To subdue her take her outside on a sunny day and she’ll roll over on her back and soak up all the rays and Vitamin D she can. That bond is the foundation on which Prejean created Cajun Paws Rescue, an independent shelter service created in 2012 for unwanted pit bull type breeds. The not-for-profit extends the stay of pit bulls about to be put down at the pound by shepherding them into a temporary foster situation while diligently and proactively finding suitable long-term owners via social media or pop-up public appearances. “When you boil it down, I wanted to save the lives of dogs that were the most discriminated against and most neglected and the most misunderstood,” Prejean says. “They have a bad stereotype. People think that they’re (these) big, mean, vicious, severely aggressive dogs — like they’re these monsters. Really, they’re just another dog like every other breed out there. There are no facts or proof that they’re more aggressive than any other breed. That Prejean remains this devoted to this particular cause isn’t a shock considering her past. As a child, she cried many evenings because her father wouldn’t let her dogs sleep inside the house — including Scooby, her first pit bull. Funded entirely by private donations, Cajun Paws Rescue generally handles 10 to 12 dogs at a single time, though that number can swell to 25 when puppies are present. Though Cajun Paws does have a temporary shelter, the dogs are generally placed in a foster home when available. This happens after the shelter contacts Prejean, informing her of pit bulls it is ready to move out. In order for Cajun Paws to “tag a pit bull for rescue,” Prejean inquires with shelter officials about the dog’s back story and behavior while housed there to determine whether she believes the pit bull is adoptable. Prejean, or someone else on the Cajun Paws team, then conducts a thorough in-person temperament test. The purpose is to determine whether the dog understands commands as well as to monitor the manner in which it interacts with both animals and humans and if its demeanor changes in certain environments such as feeding time. Once in the Cajun Paws system, many of the dogs join Prejean and “show out” to prospective owners. All of those dogs are current on vaccinations, spayed or neutered, heartworm tested, dewormed, microchipped and receive specific medical treatments addressing any pre-existing ailments. Beyond answering frequently asked questions, Prejean tends to think of herself as a vocal advocate for all pit bulls, quick to clear up misconceptions that many out-of-the-know consider truths. Speaking of puppies, Prejean notes that those are usually the first to go and attract potential owners from as far away as East Texas. For the rest of the dogs, Cajun Paws actively seeks a permanent placement — partially because it’s best for the canine but also because there is only so much room at the facility. Therefore, every Cajun Paws newbie is promoted tremendously on social media, links are shared on Facebook and every animal receives a profile on petfinder.com. Beyond traditional measures, the Cajun Paws crew isn’t averse to getting creative putting some extra shine on a pooch’s coat when necessary.